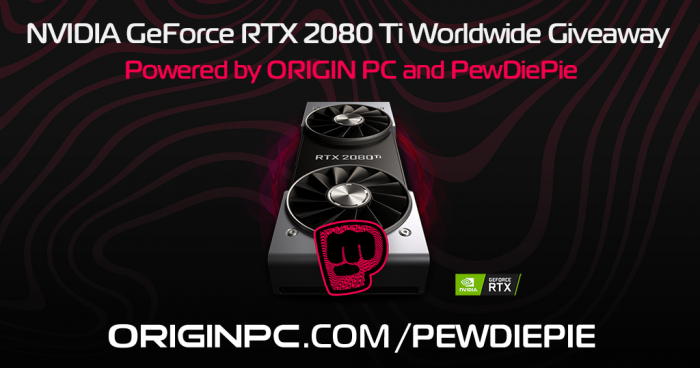 OriginPC has teamed up with PewDiePie to gift one of their fans with brand new gaming graphics card! To enter in this NVIDIA GeForce RTX 2080 Ti Graphics Card Giveaway grab your free entries by following few simplče steps listed down below! NVIDIA’s newest flagship graphics card is a revolution in gaming realism and performance. Its powerful NVIDIA Turing GPU architecture, breakthrough technologies, and 11 GB of next-gen, ultra-fast GDDR6 memory make it the world’s ultimate gaming GPU.